It’s been a while, right? You’ve missed this. I know you have. You, like me, need these mental hot-oil-wrestling sessions to keep yourself sane. And I think I have a good one today — it involves the very idea of existence. And cars, of course. Sweet, sweet cars. Thanks to some magically-tainted shellfish, you have been granted the ability to materialize, out of thin air, absolutely any car you can imagine. It has to keep within the basic boundaries of physics, but if you can imagine it, you can have it. 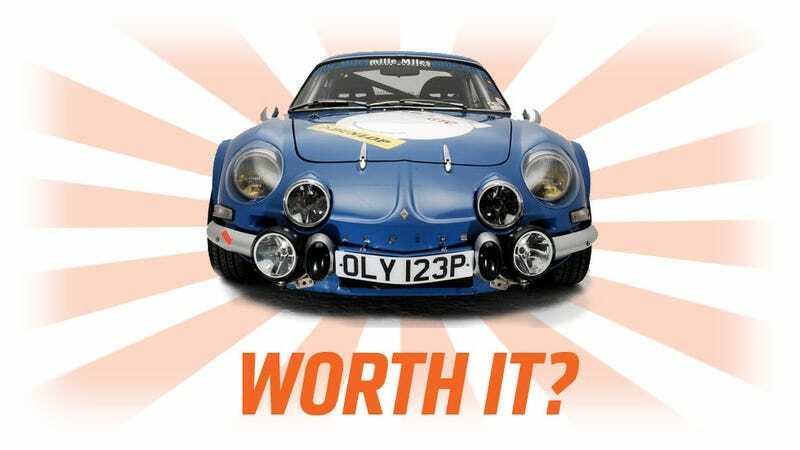 Want a Renault Alpine with a second engine up front and an eel-leather interior? It’s yours. Oh, but there’s a catch: to have the car, you must spend every other year as a car. The car you’ll be is selected at random, and you’ll have some degree of awareness, and a limited form of sentience. You’ll still be you, in a way, but you’ll be a car. For a full year, every other year. I hope you’re not a rental. An out-of-work Egyptian god, Set, was bored and came down to Earth. A huge fan of racing, he makes you an offer: you can be the best racer in the world, maybe even in history, in any form of motorsport you choose. You’ll have the natural ability to win pretty much any race you enter, whether it’s NASCAR, the Dakar Rally, a karting tournament, whatever. You’ll win. Of course, it’s not that easy. If you accept this remarkable gift, you’ll become a fabulously wealthy, beloved, and talented racer — but that’s it. When you’re not actively engaged in a race, you’ll go dormant. Set will give you, say, an hour or so of buffer time before and after your racing time to be a fully aware person — any other time, you’re basically in a coma. You can race all you want, anytime you want, anywhere you want. But you can’t do anything else, ever. So, what will it be? Be a car to get a car, or be a racer and nothing? I can’t wait to hear what you pick, and why. The whys are always good.